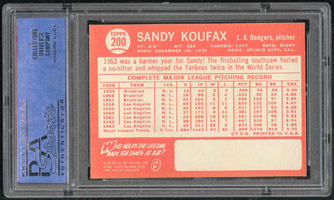 Sandy Koufax had two careers. His best record in his first six years was an 11-11 mark. But, between 1961 and 1966, the lefty led the NL in wins and shutouts three times. 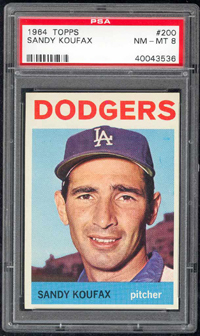 Koufax paced the Dodgers to pennants in '63, '65, and '66 while winning the Cy Young Award each year. His 25-5 record in 1963 earned him the NL MVP. 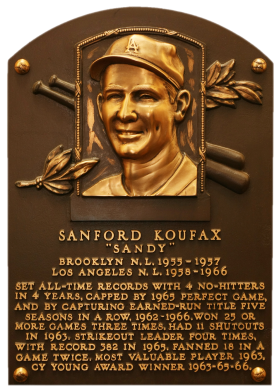 Pitching in excruciating pain due to arthritis, Koufax led the NL in ERA in his final five seasons, culminating with a 1.73 ERA mark while going 27-9 in 1966. He retired at the peak of his profession with a 165-87 record, 2.76 career ERA and 2,396 strikeouts to only 817 walks. Comments: Ultra clean photo and image on this investment grade card. Terrific centering and strong NrMint-Mint corners. Bright Dodger Blue front and nice orange reverse. 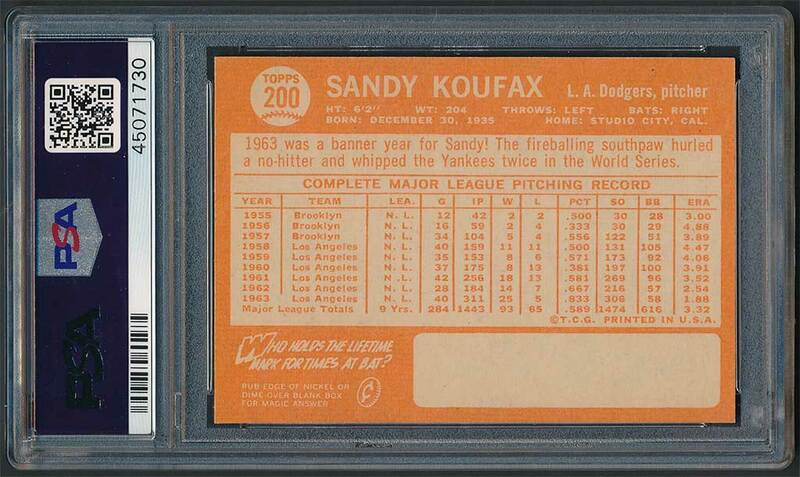 A great Koufax card! 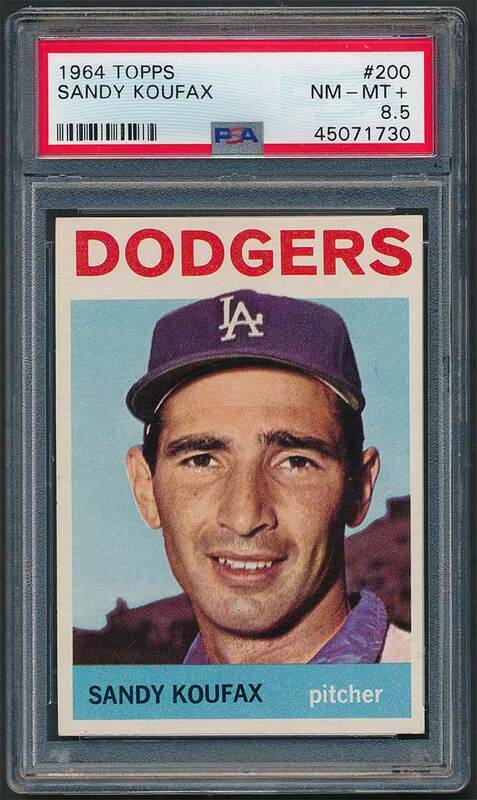 I first purchased a 1964 Topps Koufax PSA 8 in 1999. I've always loved the colors on this card, and I'm not a Miami Dolphins fan! It was sold on my website for a little profit and quickly replaced with another example. Turns out that card was a WIWAG example after a review - and subsequently replaced by PSA with this copy in June, 2003. 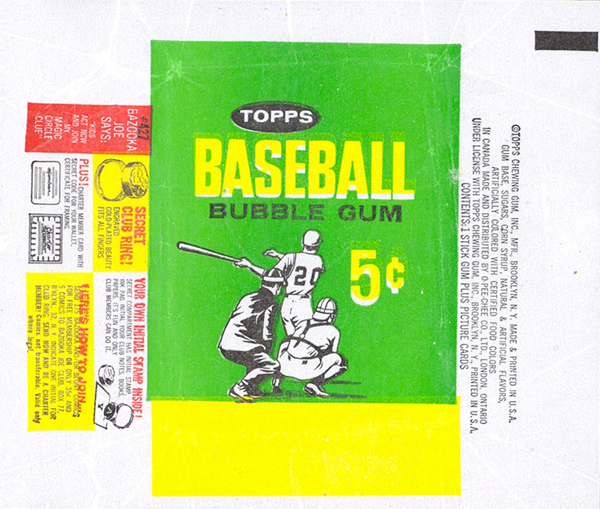 This is one of those cards I'd like to upgrade to a strong mint example someday.